For National Tequila Day, July 24th, expand your knowledge of tequila. It’s not just a Margarita mixer, but comprises five different expressions, two of which you’d never mix! Plan a tasting party with the first four expressions—and the fifth, if you’re in the chips. The spirit gets its name from the municipality of Tequila, in the west-central Mexican state of Jalisco (40 miles northwest of Guadalajara). The native Aztecs fermented agave into mezcal, the forerunner of tequila; but did not know how to distill. That knowledge arrived with the Spanish conquistadors in the 16th century. When they ran out of the brandy they brought, they began to distill agave into what is now called tequila. Tequila is one of five major distilled spirits that are indigenous to the Americas. Can you name the others? The answers are at the end of this article. Tequila is made by distilling the juice from the blue agave plant, not a cactus but a large succulent closely related to lilies. The best tequila is 100% blue agave, the finest agave juice that minimizes the “burn.” But at the two entry levels, tequilas can be “mixto,” at least 51% blue agave with the remainder coming from other agave species. They must be so labeled. Depending on the aging process and the quality of the agave, the tequila becomes one of the following five types. The more a spirit is aged, the more complex the flavors. Also called: White, plata/silver or platinum tequila. Qualities: Clear and transparent. The tequila is unaged, bottled or stored immediately after distillation. It can also be briefly aged, up to two months. Use it for: Mixed drinks. Also called: Gold or young tequila. Qualities: Pale yellow in appearance. This is un-aged tequila that is blended with rested or aged tequilas; or can be colored with caramel coloring, sugar-based syrup, glycerin, and/or oak extract to resemble aged tequila. Qualities: Light yellow and translucent, the tequila is aged for at least six months but less than a year. The spirit takes on a golden hue and the flavor becomes nicely balanced between agave and wood. American or French oak barrels are most commonly used* for aging, although bourbon, cognac, whiskey or wine barrels can be used. The tequila will take on nuanced flavors from the spirit that was previously aged in the barrel. Reposado began to emerge as a new category of tequila in the late 1980s. Also called: Aged or vintage tequila. Qualities:: brighter yellow, aged at least one year, but less than three years. The tequila is aged in smaller barrels where the flavor can become smoother, richer and more complex. The aging process darkens the tequila to an amber color. Also called: Extra aged or ultra aged tequila. Qualities: Golden color, aged at least three years in oak. This is a new classification which received official classification in 2006. It is the most expensive tequila, made from the finest agave for true connoisseurs. In Mexico, the most traditional way to drink tequila is neat, without lime and salt, or as a sangrita. 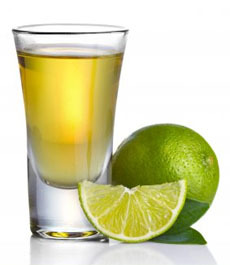 Outside of Mexico, a shot of tequila is often served with salt and a slice of lime. This is called tequila cruda. In some regions of Mexico it is popular to drink a shot of fine tequila with a side of sangrita, a sweet, sour, and spicy drink usually made from orange juice, grenadine or tomato juice, and hot chiles. 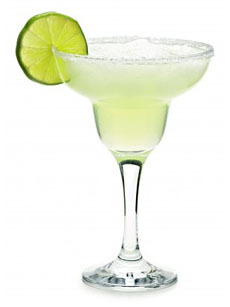 Equal shots of tequila and sangrita are sipped alternately, without salt or lime. Another popular drink in Mexico is the bandera (flag, in Spanish), named after the Flag of Mexico, it consists of three shot glasses, filled with lime juice (for the green), white tequila, and sangrita (for the red). The tequila shot glass is called a caballito, “little horse.” Photo courtesy WiseGeek.com. When served neat (without any additional ingredients), tequila is most often served in a narrow shot glass called a caballito (little horse, in Spanish), but can be served in anything from a snifter to a tumbler. In 2002, the Consejo Regulador del Tequila (regulating council) approved a stemmed “official tequila glass” shape made by the great glassmaker, Riedel. It’s called the Ouverture Tequila glass and, like all Riedel glassware, is engineered to enable the finest aromas and flavors from the spirit. Many people believe that some tequilas have a worm in the bottle. They don’t; but certain brands of mezcal do contain a worm, the larval form of the moth Hypopta agavis, which lives on the agave plant. The larvae are used by several brands of mezcal to give flavor to the spirit. As a marketing gimmick that began in the 1940s, some brands put a worm in the bottle. Any flavor from the worm has long been removed during production. According to the website Mezcal-de-Oaxaca.com, in 2005 the Mexican government legislated to remove the worm from mezcal (it was already prohibited in tequila). One reason is that at 20¢ to 40¢ per worm and between 200-500 worms per plant, irresponsible harvesters actually uproot and destroy an agave plant to harvest the worms. Tequila should not contain an insect of any kind, and if it does, then “you’ve either purchased gag-inducing hooch aimed at gullible gringos, or your top-shelf booze is infested by some kind of alcohol-breathing, alien bug,” according to author James Waller (Drinkology: The Art and Science of the Cocktail, page 224, published 2003). Also indigenous to the Americas: Bourbon (USA), cachaça (Brazil), mezcal (Mexico), pisco (Peru) and rum (Caribbean). Numerous other spirits are distilled locally throughout the Americas, but are not distributed far beyond their place of origin. *After fine wine is aged in [expensive] new oak barrels, the used barrels are often sold to the producers of spirits for aging. New oak imparts specific flavors to wine; but with spirits, the distiller is not looking for prominent oak flavor. Thus, the same used barrel can be used for several years, where it imparts slight nuances.